The follow are instructions for using the Stark Tables for finding UT and Longitude with a work form that I have modified from the original Stark Tables form. This procedure requires a copy of the Stark Tables, which also have notes included related to this process. A printed form and interactive excel file for the form is at the end of instructions. follow the numerical steps to fill out the form. [A] Do an IC check using the Moon or Sun (3 on and 3 off). It has been found that using the Sun (with a special Baader Film filter) is preferable to using the horizon. The procedure for the IC sights and how to make the filter is explained in How to Use the Plastic Sextants. [B] Time and measure a set of Lunar Distances. Try to do at least 6 sights. [C] Do another IC check as above. [D] Average your Lunar Distances and Times to obtain a single value of Time and Distance for your determination of your GMT and Longitude. A direct average can be used, or better still use the Fit Slope method explained in detail in Hawaii by Sextant. OPTION 1 - Take normal sights of both Bodies for their respective Hs if possible. This requires a good sea horizon or an artificial horizon. OPTION 2 - Compute the Hc for the Moon and Other Body. This is a bit circular as you must know your Lat and Lon, but you can use an approximate position. These values are not super crucial. They are mainly used to compute a refraction correction. For the computations you can use the standard trig functions, or use get the answer online from starpath.com/usno or starpath.com/calc. Fill in the main data for the sight: Date, Times (Local and GMT), Bodies, IC, Near or Far sides of the bodies used, HP for the Moon, and p (additional altitude correction if Venus or Mars). These go in the blue boxes 1 through 19 at the top of the Form. Box 1 is for your Sight Identification. Note that the parallax of Venus or Mars, when applicable, is called "p" on page 259 of the Nautical Almanac, but it is called "Additional altitude correction" in Table A2. In our form it is labeled "p."
Using OPTION 1 from above. Using Stark's Table 1, lookup values for your Bodies and enter them in boxes 20, 21 for your Other Body and 26, & 27 for the Moon. Unless otherwise noted, when entering the Stark Tables using a value that is in-between two values listed in the tables, always take the answer corresponding to the higher one. Do not interpolate. Add your Bodies Hs degrees (box 14) and box 20 values to obtain Sa degrees and enter in box 30 repeat with boxes 15 & 21 to obtain Sa minutes and enter in box 31. Then add the Moon's Hs degrees (box 16) and box 26 values to obtain Ma degrees and enter in box 32, repeat with boxes 17 & 27 to obtain Ma minutes and enter in box 33. Enter Stark Tables with the Moon Hc to extract the WWP correction and enter in box 22 & 23, then got to the WWRef Table to get the parallax correction for both the Moon (enter value in box 28 & 29) and the other Body (enter value in box 24 & 25). Upon examining the Ma (boxes 32 & 33) and Sa (boxes 30 & 31) values select the column where you can write the smaller value under the larger. If the Ma is less than Sa copy the value in box 32 into box 42 and copy the value in box 33 into box 43. Otherwise copy the value in box 30 into box 44 and the value in box 31 into box 45. Subtract the lesser value to get the Ma ~ Sa value either in boxes 46 & 47 or in boxes 48 & 49. You could now copy the Ma ~ Sa values thus found and recorded into boxes 73 (degrees) & 74 (minutes) in Section 2. Enter Table 2 and extract the 2 values at the Ma (boxes 32 & 33) and HP (box 18) row/column intersection, insert these values on the Form in boxes 34 & 35, also extract and enter the values in the sidebar table for the additional HP remainder from the value in Table 2 in boxes 36 & 37. Enter Table 3 for the same 2 values for the Other Body (Sun, Jupiter, Stars and Saturn columns are self explanatory, Venus and Mars have special columns based on their HP) Enter the Table 3 values in boxes 38 & 39. Once these values are entered add the values in boxes 34, 36, & 38 together and enter in box 40. Next, add the values in boxes 35, 37, & 39 together and enter in box 41. Round the value in box 40 to 1 decimal place and enter it under the Ma ~ Sa value obtained earlier (your rounded value will be entered in either box 50 or 51). You will be adding this value to Ma ~ Sa value if you Lunar Distance sight was to the Far side of the Moon or subtracting if it was to the Near side. This operation will result in the H ~ H value (depending on which column you are working in this H ~ H will be in box 52 & 53 or in box 54 & 55) . You could now copy the H ~ H values thus found and recorded into boxes 84 (deg) & 85(min) in Section 2. You have now completed the Input section (Section 1) of the Form and are ready to compute your Cleared Lunar Distance (D) using the Green highlighted boxes 91 & 92 in the next section of the Form. Add the values in boxes 34, 36, & 38 together and enter in box 40. Next, add the values in boxes 35, 37, & 39 together and enter in box 41. Round the value in box 40 to 1 decimal place and enter it under the Ma ~ Sa value obtained earlier (your rounded value will be entered in either box 50 or 51). You will be adding this value to Ma ~ Sa value if you Lunar Distance sight was to the Far side of the Moon or subtracting if it was to the Near side. This operation will result in the H ~ H value (depending on which column you are working in this H ~ H will be in box 52 & 53 or in box 54 & 55). Enter Table 4 to obtain the Moon's Augmented Semi-Diameter value using your Ma value (box 32 & 33) and the Moon's HP (box 18) and enter that value in box 56 on the Form. Next, go to Table 5 to obtain the Sun's Augmented Semi-Diameter value using your Sa value (box 30 & 31) and enter that value in box 57 on the Form. Add box 56 and 57 together and enter the result in box 58. If you are dealing with Low Altitudes for the Sun or Moon enter the appropriate value from Table 6 in box 59. Subtract the value in box 59 from the value in box 58 and enter the result in box 60. Round this result to 1 decimal place and enter it in the box that matches the column for Near (box 65) or Far (box 66) as appropriate for your sight. Next bring down your Ma ~ Sa value, if you have not done so already, and subtract the Ma ~ Sa value in box 73 & 74 from the Da in box 71 & 72 entering the result in boxes 75 & 76. Then add Da (boxes 71 & 72) and the Ma ~ Sa (boxes 73 & 74) values together entering the result in boxes 77 & 78. The next operation requires entering the K Table and extracting the K value for the Da/ Ma ~ Sa (boxes 75 & 76) difference and entering that K value in box 79 and the Da/ Ma ~ Sa (boxes 77 & 78) addition and entering that K lookup value in box 80. Add these two K values (boxes 79 & 80) together entering the result in box 81 and then divide that result (box 81) in half and enter that value in box 82. Bring down the Q value (box 41) from Section 1 of the Form and copy it to box 83, next, add boxes 82 and 83 together and enter the result in box 84. Round the value in box 84 to 5 decimal places. Compare the Value in box 86 with the value in box 84a. If box 84a is less than box 86 copy the value in box 84a into box 87 and subtract box 87 from 86 and enter the result in box 88, otherwise copy the value in box 86 into box 89 and subtract box 89 from box 84a and enter the result into box 90. Lookup this 'resulting value' (box 88 or 89 value) in the body of the Gaussians Table and extract the 3 digit value at the top of a column where your 'resulting value' is found and extract the 2 digit number next to your 'resulting value'. Place these digits as a 5 digit number (first the 3 digits, then the 2 digits) in the empty box under the number you originally moved to the other column(if you entered the Gaussian table with box 88 enter the gaussian value in box 89 OR if you entered the Gaussian table with the box 89 value enter the gaussian value in box 87. (put a line through your 'resulting value' so you do not mistakenly use that value in the next step. If your gaussian value was placed in box 89, subtract box 89 from box 84a and enter result in box 90, otherwise subtract box 87 from box 86 and enter the result in box 88. Now enter the K Table again, but this time this latest result (box 88 or 89) will be found in the body of the K Table. You will be determining the degrees from the page and the minutes and tenths from the row and column in the K Table. This resulting Value as found in the K Table is your Cleared Lunar Distance (D) and is now entered in Green highlighted boxes 91(deg) and 92 (min/tenths). You have now computed your Cleared Lunar Distance (D) boxes 91 (deg) & 92 (min) and have completed Section 2. Next, You will determine the Computed Lunar Distance for the Hour PRECEDING and Hour FOLOWING the TIME of your Lunar Distance Sight in order to determine the Computed Lunar Distances for those hours. The next steps involve entering the Nautical Almanac and extracting the GHA and Declination for the Moon and the Other Body for the Hour PRECEEDING and FOLOWING the TIME of your Lunar Distance Sight. If the Other Body is the Sun or one of the Planets the GHA degrees and minutes are entered in the center column boxes 105 through 110. The Declinations are entered in the left column in boxes 111 through 119 (Preceding) and 149 through 157 (Following). Please make sure that you note the sign (N/S) in boxes 111 and 115 (Preceding) and 149 and 153 (Following). If your Other Body is a Star the computations required for determining the GHA of the Star are provided in the right hand column boxes 93 through 101 (Preceding) and 131 through 139 (Following). Once you have entered the GHA and Declination of your Bodies in the appropriate boxes, enter the difference between the GHAs in boxes 109 & 110 (Preceding) and 147 & 148 (Following) and the difference between the Declinations in boxes 118 & 119 (Preceding) and 156 & 157 (Following). NOTE: make sure that you take into account the SIGN of the Declination when determining the difference - i.e. Same = subtract, Contrary = add. 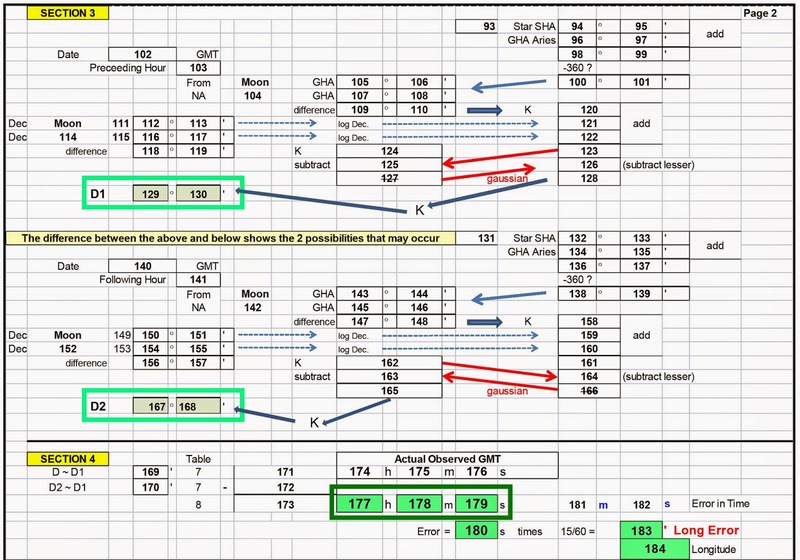 The next step involves entering the K Table with the value of the GHA difference boxes 109 & 110 (Preceding) or 147 & 148 (Following) and entering that K value in box 120 (Preceding) or box 158 (Following). Then, enter the log Dec Table with the Declination values and extract the log Dec for each Declination and enter those log Dec values in boxes 121 & 122 (Preceding) and 159 & 160 (Following). Add the values in boxes 120, 121 & 122 (Preceding), enter result in box 123 and in boxes 158, 159 & 160 (Following), enter result in box 161. Enter the K Table once more with the difference between the Declinations Boxes 118 & 119 (Preceding) and boxes 156 & 157 (Following) and extract the K value and enter it in box 124 (Preceding) and box 162 (Following) in the center column of the Form as indicated. The next step is to compare the values in boxes 123 & 124 (Preceding) and boxes 161 & 162 (Following). The accompanying Form shows how to handle the TWO POSSIBILITIES resulting from the comparison. Either or both possibilities can occur in your solution. In the PRECEEDING area the value in box 123 is lesser than the value in box 124, thus we will copy the value in box 123 into box 125. Then, subtract the value in box 125 from the value in box 124 and enter the result in box 127. You will now enter the Gaussian Table with the value in box 127 in the body of the Gaussians Table and extract the 3 digit value at the top of a column where your 'value' is found and extract the 2 digit number next to your 'value'. Place these digits as a 5 digit number (first the 3 digits, then the 2 digits) in box 126 (put a line through your 'value' in box 127 so you do not mistakenly use that value later. Next, subtract the value in box 126 from the value in box 123 and enter the result in box 128. Now enter the K Table again, with box 128 value which will be found in the body of the K Table. You will be determining the degrees from the page and the minutes and tenths from the row and column in the K Table. This resulting Value as found in the K Table is the Computed Lunar Distance (D1) and is now entered in Green highlighted boxes 129 (degrees) and 130 (minutes/tenths). In the Following area the value in box 162 is lesser than the value in box 161, thus we will copy the value in box 162 into box 164. Then, subtract the value in box 164 from the value in box 161 and enter the result in box 166. You will now enter the Gaussian Table with the value in box 166 in the body of the Gaussians Table and extract the 3 digit value at the top of a column where your 'value' is found and extract the 2 digit number next to your 'value'. Place these digits as a 5 digit number (first the 3 digits, then the 2 digits) in box 163 (put a line through your 'value' in box 166 so you do not mistakenly use that value later. Next, subtract the value in box 163 from the value in box 162 and enter the result in box 165. Now enter the K Table again, with box 165 value which will be found in the body of the K Table. You will be determining the degrees from the page and the minutes and tenths from the row and column in the K Table. This resulting Value as found in the K Table is the Computed Lunar Distance (D2) and is now entered in Green highlighted boxes 167 (degrees) and 168 (minutes/tenths). NOTE. Either possibility can occur in the PRECEEDING hour or FOLLOWING hour areas in your solution and not necessarily in the order or place that I have shown them. You have now completed Section 3 and determined the Computed Lunar Distance for the Hour PRECEDING (D1) and Hour FOLOWING (D2) the TIME of your Lunar Distance Sight. Next you will determine the Computed GMT for your Cleared Lunar Distance in Section 4. Compare your D value in boxes 91 & 92 with the D1 value in boxes 129 & 130 and enter the difference in box 169. Usually it will only be necessary to use the minutes/tenths values in boxes 92 & 130 as the degrees are generally the same. Next, compare your D1 value in boxes 129 & 130 with the D2 value in boxes 167 & 168 and enter the difference in box 170. Usually it will only be necessary to use the minutes/tenths values in boxes 130 & 168 as the degrees are generally the same. Now enter Table 7 with the values in boxes 169 & 170 and enter the respective values found into boxes 171 & 172. Subtract the value in box 172 from the value in box 171 and enter the result in box 173. Go to the Table 8 body with the value in box 173 and find the minutes and seconds corresponding to that value. Enter the resulting values in box 178 (minutes) and box 179 (seconds). Copy the value in box 103 (Preceding Hour) into box 177. You now have the Computed GMT in boxes 177 (hr), 178 (min), & 179 (sec). Copy your GMT from box 7 into boxes 174 (hr), 175 (min), & 176 (sec). Once you have done this enter the difference between boxes 176 & 179 into box 180. Note: you may have to get the difference between the minutes found in boxes 175 & 178. If you do convert the result into seconds and add this result to the value in box 180. The value in box 180 is your Error in Time. By dividing the value in box 180 by 4 (derived from 15' of arc movement in 60 seconds of time) and entering the result in box 183 you have determined your Longitude Error. Applying this error to your DR Longitude in box 4, you will calculate your Computed Longitude. Enter this value in box 184. You have now completed Section 4 and have determined your Computed GMT and corresponding Longitude for your Lunar Distance Sight. GOOD LUCK WITH YOUR LUNAR DISTANCE SIGHTS. 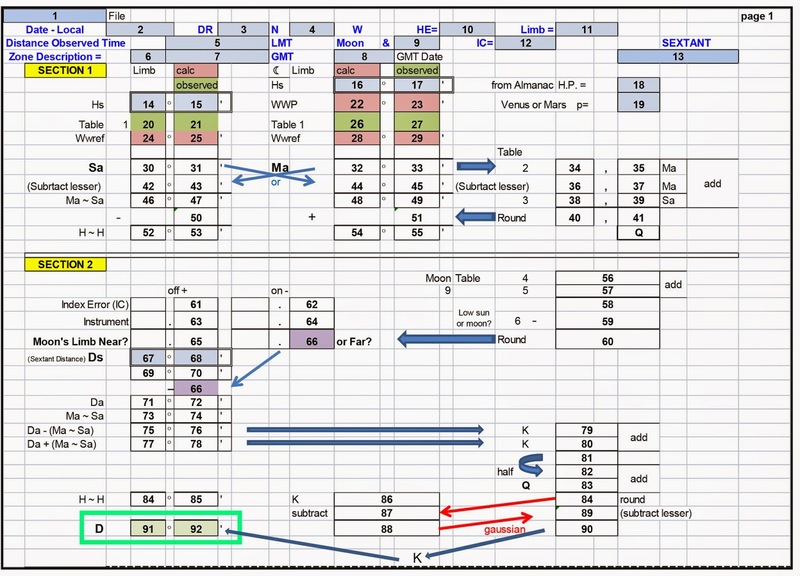 Editor's note: A copy of the full Miller-Stark-Form is shown below, annotated with the box numbers referred to in the text along with some notes, colored boxes, and some arrows indicating where to place certain data values. You can here download Miller-Stark-Form.zip. You can use it interactively, which does intermediate math for you, or you can print it for full manual use. A set of instructions is included... or print this article.